Do9wn to the bottom of the French Pile? You clearly ned to order kore figures, John. I recently decided to add a 2nd unit of Grenadiers a Pied and Chasseurs a Pied, plus the "Immortals" (Gendarmes d' Elite)for mmy Montmirail games at Historicon in July. That is with well over 1,000 painted French Napoleonics. Black Hole indeed, LOL! Thanks you all. I probably spend about 60-70 minutes per figure, so 12-14 hours for the 11 figures, cannon and horses. White prime, blocked colour, then Citadel washes, no AP this time. Highlights after washes. Wow, French almost all done hey? Impressive. Nice work on those Chasseurs. 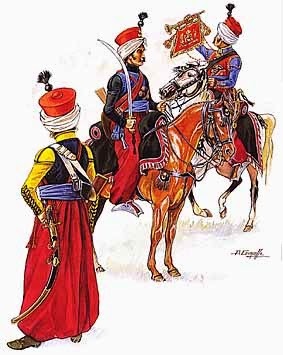 Love your Guard Mamelukes John. Even though I'm rebuilding my collection with Perry's I keep a lot of my old Foundry figures too - they're so unique and full of character.